The past week has been filled with new things, and frankly I think it has breathed new life into me.s I have been attempting to discover new places and people in an effort to escape boredom and frustration. School is finishing up for the year and will go on summer break in two days. While they are busy with exams, I have had to find other ways to keep busy. Things started to look up last weekend when Matt and I FINALLY went to a pool that is only a kilometer away. 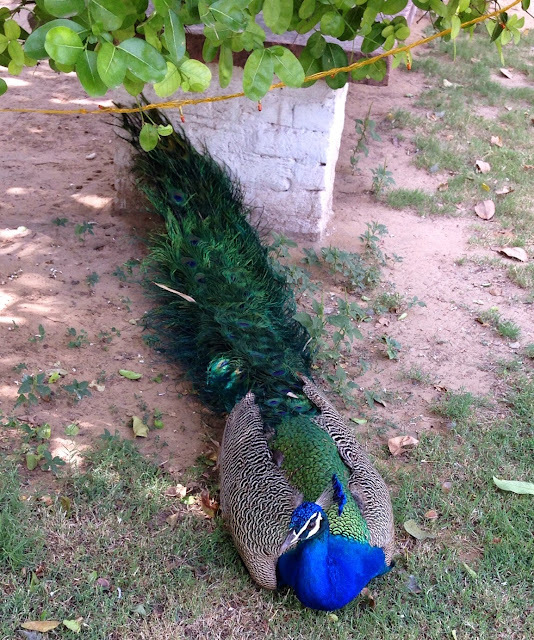 It is at a hotel called the Narain Niwas Palace and is a total sanctuary. We decided to walk there after first having lunch at a Subway in a mall across the street. (The Subway was gross by the way). We were unsure how to get there and went the long way by accident. It was 100 degrees, walking on a street littered with traffic and tuk tuks shouting and practically running us over to give us a ride. I was feeling irritated, (imagine that! ), but when we finally got there it was so worth it. The hotel is tucked away from the street and is surprisingly quiet. 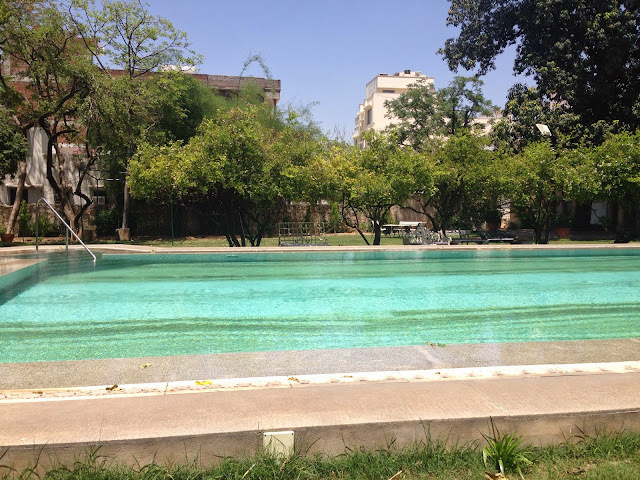 After paying 250 rupees (about $4) at the front desk, we walked to the pool and were quickly greeted by a gentleman who laid down fresh chair cushions and towels. It was very relaxing, and the pool was a great place to cool down from the heat. I have since been to this pool several times, and I have a feeling I will continue to be a repeat customer. Every time I have gone, I notice the same people are always there, mostly foreign women. No one is taking pictures or staring which is awesome, and I can read the gossip magazines my friend sent me! It's perfect. 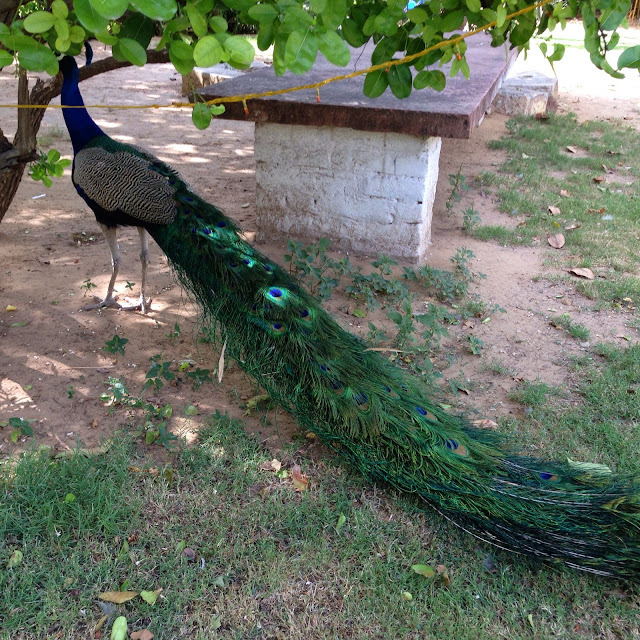 There are many beautiful peacocks which strut around. 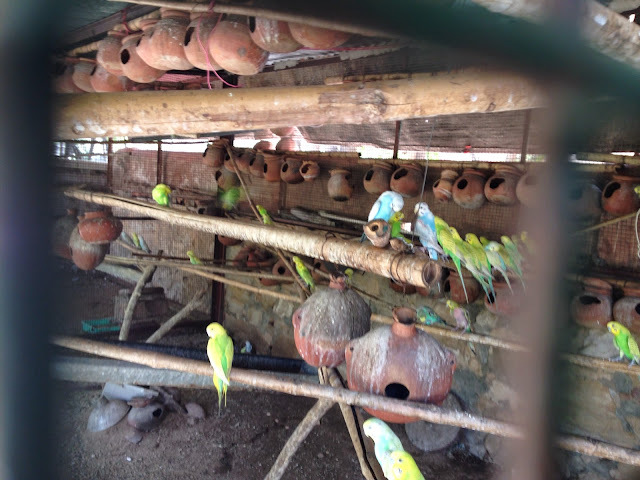 On the path towards the pool, there is a large cage filled with parakeets. Besides the pool being an awesome new place, I have made friends! I have a bad feeling I may have come off desperate, but I was just so happy to meet women in a similar position as myself. 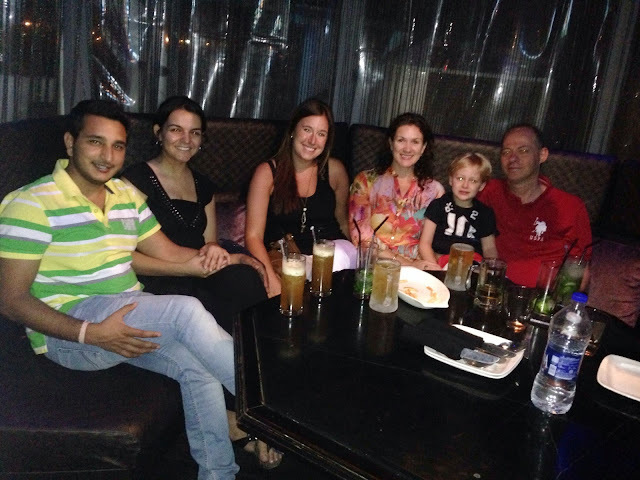 I met these girls through the Jaipur Expats Facebook page. I know it sounds creepy to meet people online, but desperate times call for desperate measures. The challenging part is that the Facebook group has a few hundred people on it, but most of them are Indian men preying on young foreigners. It's hard to weed out the creepers to find those who are actually expats. These girls and I met at a place called On The House for coffee last Tuesday. Marcela is here from Brazil with her husband who is working on a factory start up which will produce ATMs. They also have a four year old son. Camila who is also Brazilian, was previously here as an intern, where she met her now boyfriend. She now has moved back and is working to start her own company where she will export crafts back to Brazil. We met up a second time last night and went to a new restaurant called Blackout on the rooftop of a hotel. It was a nice atmospere with pretty good food. Unfortunately Matt couldn't come because he was out of town for work, but hopefully we can get together again. I can actually see Marcela and Roberto's apartment from our apartment window - very covenient! It feels so comforting to know that other people here are having the same experiences as Matt and I are. We've all had the same frustrating encounters with the crabby guys at the Foreign Registry Office, and we were able to share ideas of good restaurants and shopping. Marcela told me that she purchases red meat at the Marriott hotel. I will definitely have to check into this! There's only so much chicken one person can take. The last new thing I have to share, was that I took a tuk tuk by myself for the first time. I have been trying to get the courage to do this, and I am glad I finally got it over with. I am extremely grateful for our driver, but I want the indepedence of being able to go somewhere without having it planned a day in advance. A tuk tuk ride should cost about 10 rupees per kilometer (16 cents). I went from my apartment to a cafe for lunch which is 1.5 kilometers away. I put my 30 rupees, because I'm a sucker, into a pocket of my bag, preparing to be hastled. I have learned how to say "that is too expensive" in Hindi which I was also ready to shout. However, I handed him the money, no problem. Often times Matt and I end up paying 2-3 times as much, but I will no longer be taken advantage of! Last week when we went to dinner, we paid 50 rupees for a 2 kilomter ride. The guy was angry and yelling for 100 rupees. I really don't mind paying someone over a dollar for a ride, but its simply the principle of it. I want to pay as much as everyone else does. Otherwise, we develop the repuation as the people who always over pay. On my way home from lunch, I couldn't get the driver waiting outside to bring his price lower than 50 rupees, so I started to walk. I intended to get another tuk tuk, but then decided I didn't mind walking. It wasn't so bad because on Sundays the streets are much quieter, however this heat really enhances the aromas of trash and urine. So let's just say that things are not as bad as I may like to think they are sometimes. I am looking forward to getting together with Camila and Marcela again, and I will continue to work on being independent, and perhaps seeing the good in things more often.